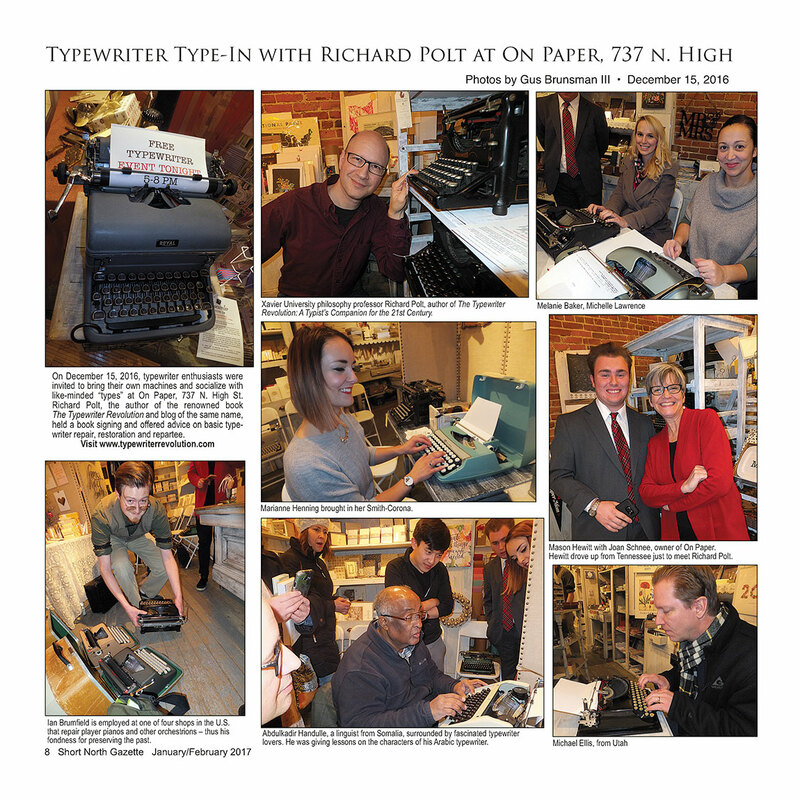 Here's a nice set of photos from December's type-in in Columbus, Ohio, from the Short North Gazette. 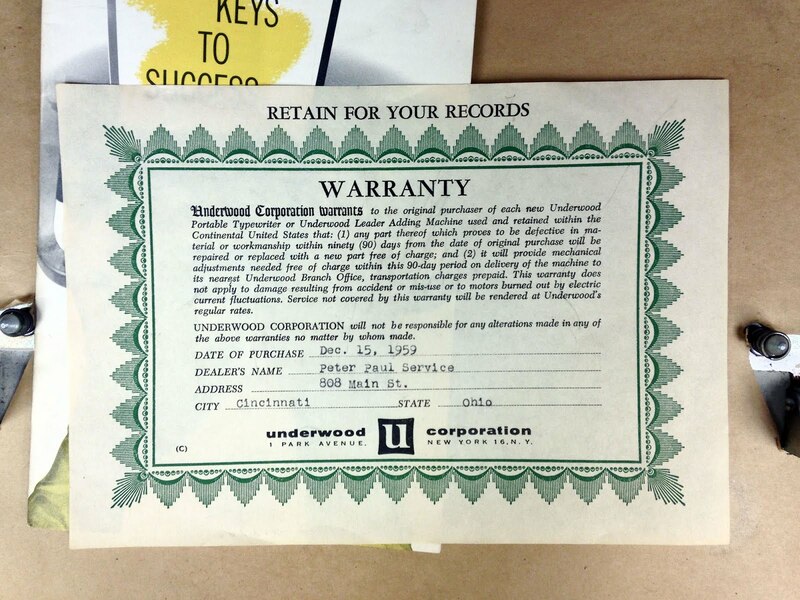 Here's an uncommon late Underwood portable that I picked up from a local seller. 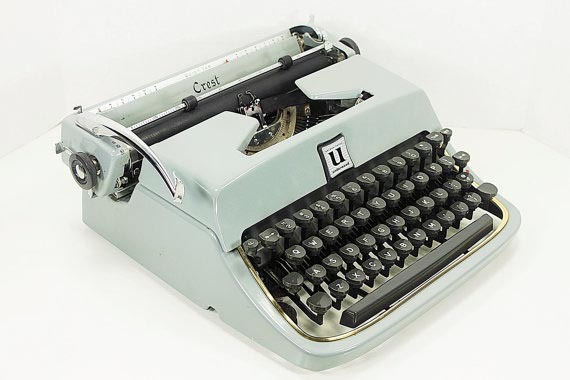 The Crest is one of many 1950s basket-shifted models that Underwood put on the market, often with interesting styling and colors. But I don't know that I've ever seen one in this particular shade, which reminds me of the '70s more than the '50s. 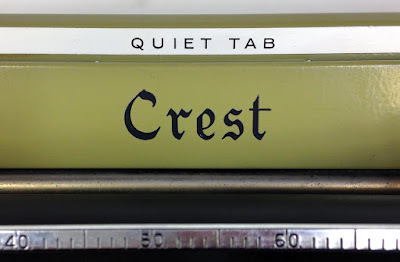 This light-blue Crest that sold on Etsy has an attractive golden strip around the keyboard. There's no sign of such a strip on my machine. Does the Crest differ mechanically from other Underwood portables of the ’50s? I don't see how. 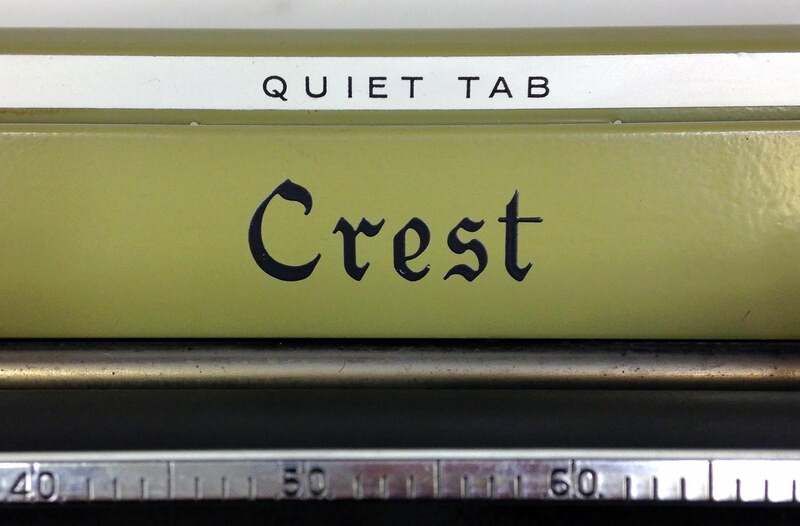 Like many but not all other models from that decade, it includes a keyset tabulator with the wishful-thinking designation Quiet Tab. The machine came in a case with paper to protect its base, a brush, paper "gold medals," a typing instruction book, and a warranty. 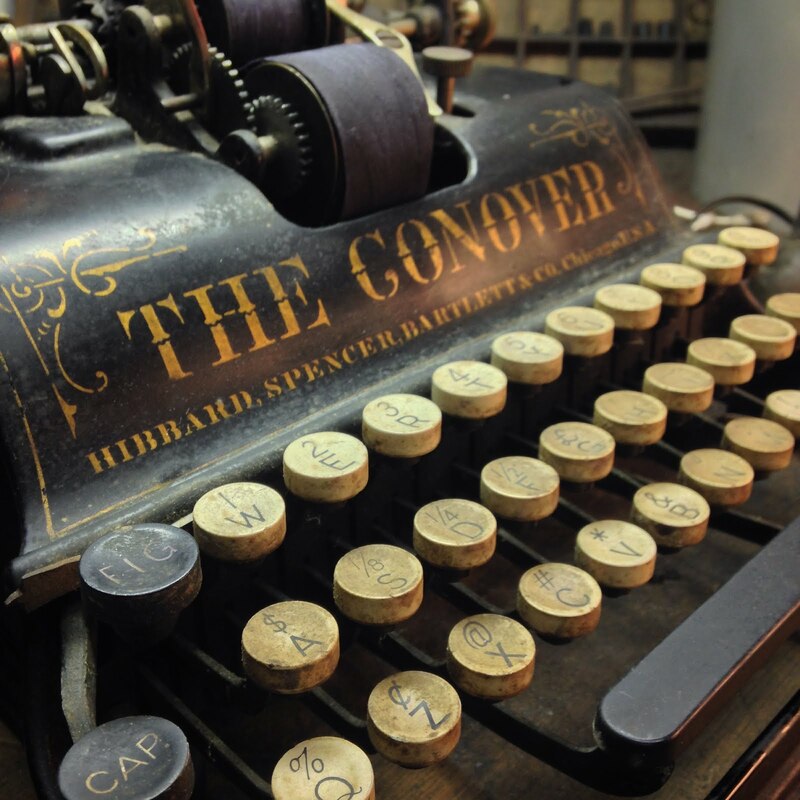 The machine was sold on Cincinnati's Main Street, our "typewriter row" at the time. Peter Paul is still in business today at a different location. Despite the sales date of Dec. 15, 1959 (was it a Christmas present? 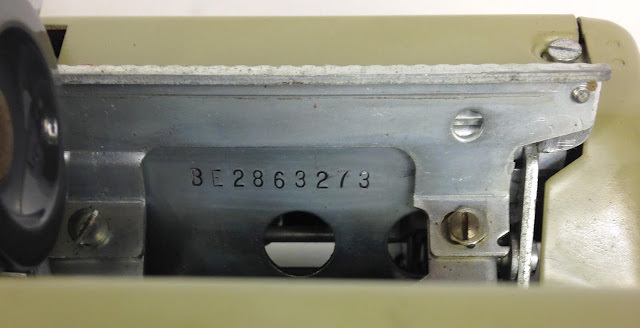 ), the serial number, BE2863273, probably dates the machine at 1957. So it's possible that this typewriter sat around in the shop for a couple of years before selling. 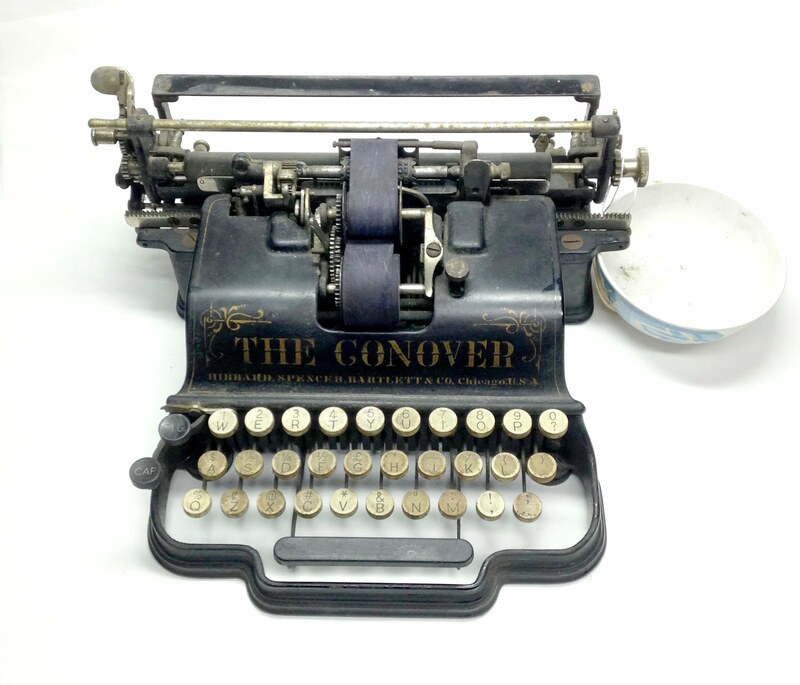 By the time this typewriter sold, Underwood had been acquired by Olivetti in "the largest-ever foreign takeover of an American company" at the time (follow the link for a substantial academic article about the acquisition). On October 2, 1959, Olivetti had become the largest shareholder of Underwood stock. • I'm no metallurgist, but the metals used on this machine seem cheap and weak. Some typebars were a little bent and could easily be bent back into place. Under the back panel there was a patch of rust, for no apparent reason. • The two springs holding up the ribbon cover were weak and could easily slip off. Just a little detail, but it shows that the "fit and finish" of this typewriter, as they say in the auto business, is not impressive. • The Underwood logo on the ribbon cover release button was just barely hanging on. If two tiny pieces of plastic break, your logo is gone. I've seen another couple of Crests online missing this logo. • The tabulator wasn't working. 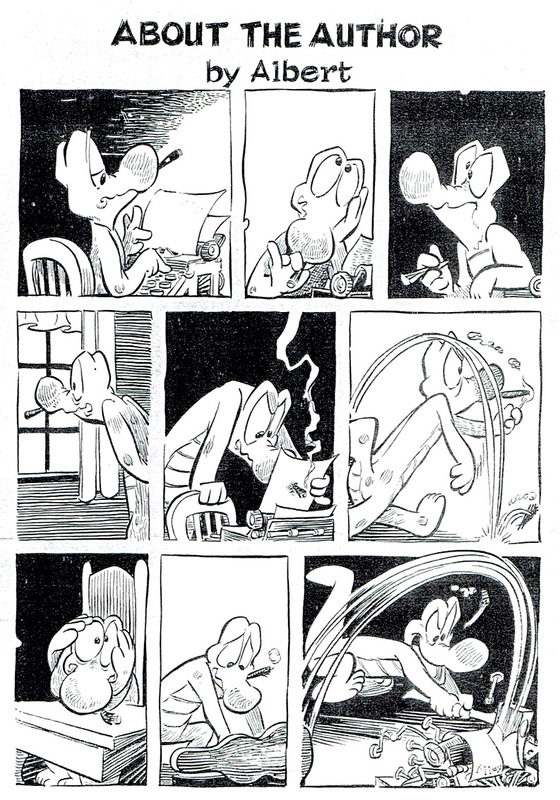 The solution was to "form" a piece, as the pros say. In other words, the thing was out of shape and had to be bent into the correct position. 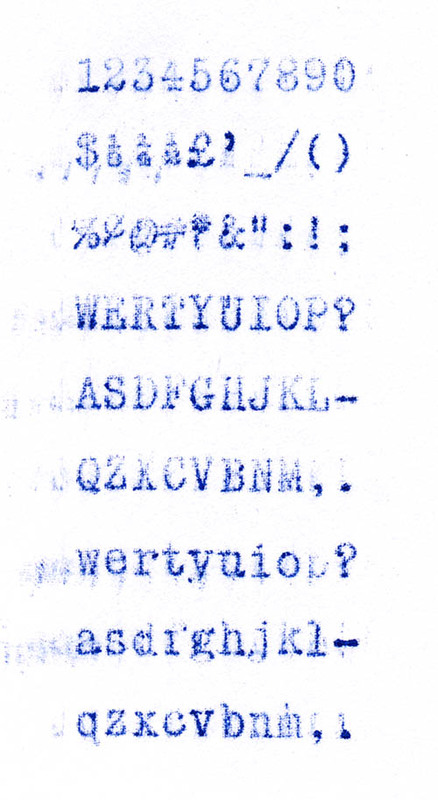 Just imagine doing that on a high-quality typewriter of the time, such as an Olympia: first of all, it wouldn't be necessary or expected; secondly, they used such high-quality metal that it would be very hard to do. 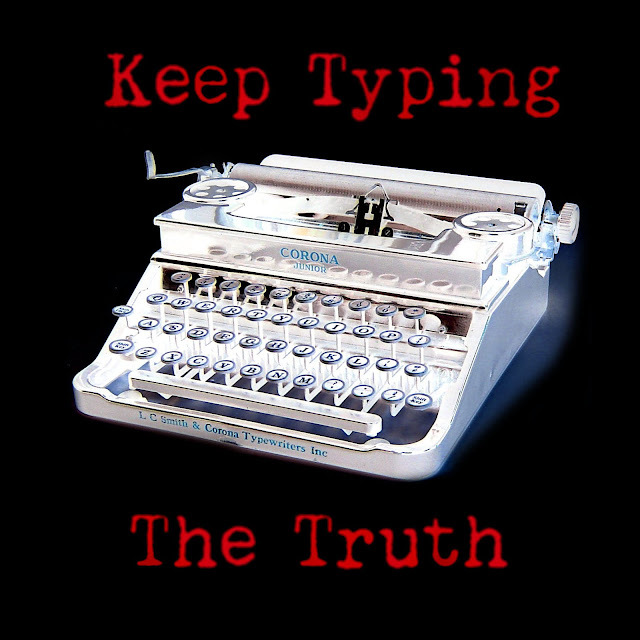 • Finally, check out this typing sample. The poor alignment isn't just a matter of bent typebars; the type has not been soldered on to the typebars consistently. Grade: C-. Cute though it is, the Crest and its ilk are the last gasp of real Underwood portables. It's too bad, because the older, carriage-shifted portables are excellent, and the new basket-shift design was an improvement, in theory. Most of the mechanical principles remained the same, so that an Underwood portable from 1929 shows many parallels to one made 30 years later. But the decline in quality and precision meant that by the time the Crest was manufactured, the golden age was long gone. PS: Here's a video found on YouTube of a Spanish-keyboard Crest that looks much like mine. Note that the Underwood logo seems to have been attached with new rivets or screws. The First Amendment should unite all Americans, regardless of party or creed, but Mr. Bannon recently said the press should "keep its mouth shut." If you type a card, I hope you'll post it online—but more importantly, post it to Washington. DonN asked to hear from Albert the Alligator in a recent comment. Here you go, Don. My source is these communications with poet and typewriter devotee Albert Goldbarth, which are well worth reading. You saw the Conover that has been entrusted to me before cleaning. Here it is after cleaning. The machine has an arm that must be extended on the left before typing. When the carriage is over on the right, this typewriter has a pretty impressive wingspan. The original rubber hammer head, which is star-shaped, broke as soon as I tried it. The rubber was, naturally, hard and brittle after all these years. After a few failed efforts, I sculped a piece of rubber that does the job, hitting the paper from behind against the ribbon and the type. And these are the results. Not perfect, but readable. Ad courtesy of Peter Weil. Bell clapper and a screw courtesy of Greg Fudacz. Ribbon made for Acroprint 125 and 150 time clocks, cut down the middle. The public typewriter that I set up in my office building some time ago doesn't get a lot of use, but once in a while it proves its value, as when I found a wonderful quote from James Baldwin on it the other day. There are some models I see again and again coming in for service at The Urban Legend Institute: Royal Quiet De Luxe, Royal KMM, Smith-Corona Galaxie, Underwood no. 5, and so on. 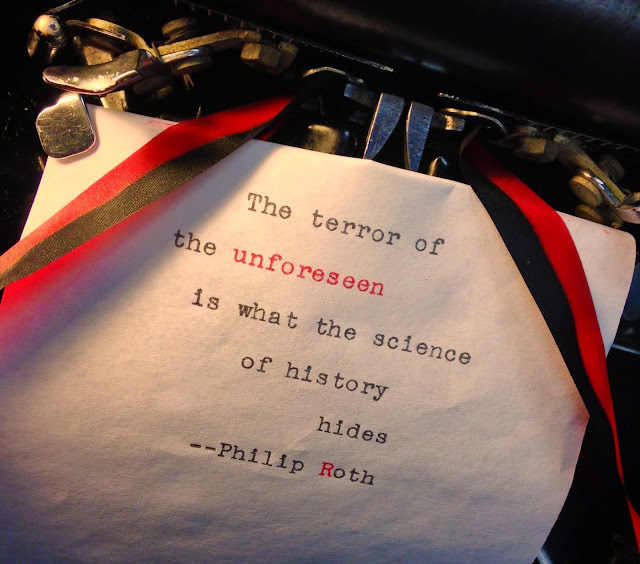 Many typewriters are from the late ’40s, reflecting the upsurge in typewriter manufacturing after the war. But I got a surprise the other day when a customer recently brought in a Woodstock, an Oliver 9, and a Conover. With his permission, I'm sharing some pictures of thc Conover here. This is a rarely-found name variant of the Chicago sold by Hibbard, Spencer, Bartlett & Co., a big Chicago hardware store which originated the still-famous name True Value Hardware. When you remove the name plate you see the wonderfully ingenious mechanism (which was left exposed on the predecessor to the Chicago, the Munson). An exchangeable type cylinder rotates and slides into the correct position. 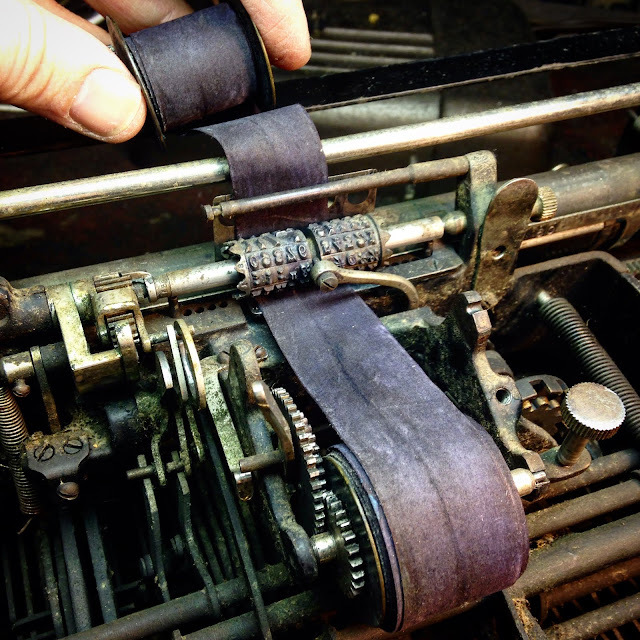 This ribbon is long, purple, and one inch wide. The centers of the ribbon spools are covered in inky wax. Note the serial number stamped into the shaft on which the type cylinder turns; it matches the machine's serial number (5383). The type cylinder is also stamped with little numbers, which may be a serial or may designate the type style. This machine should look very pretty once I'm done with it. I'll post followup pics when it's ready. If you've been reading this blog for a while, you know this game. Here are some things I saw at the antique mall this morning. Can you guess which one came home with me? I've seen these R. C. Allen miniatures before, but never one with a letter in it! I'll tell you that this is not what I brought home. The price would be a bargain for a collector with space and an understanding partner, but I don't want to get divorced. This beautiful set has been languishing at the Ohio Valley Antique Mall for months. Let's take an adding machine break. Finally, a pair of toy "Master Phones." I bet these were a thrill for their young owners!